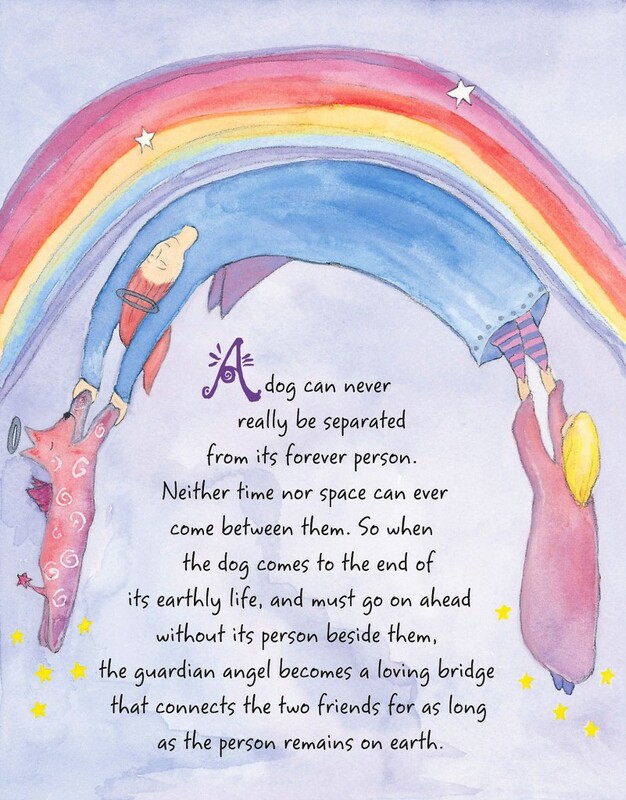 If you are welcoming a new puppy into your home… celebrating the forever dog in your life… saying good-bye to a beloved dog companion…For Every Dog An Angel is the perfect way to remember that timeless connection to your special four-legged friend. Filled with colorful illustrations on every page, this gentle and uplifting book will bring comfort and hope to anyone who is coping with the loss of a dog who was dearly loved and is deeply missed. May their paw prints dance forever in your heart! For dog lovers young and old. 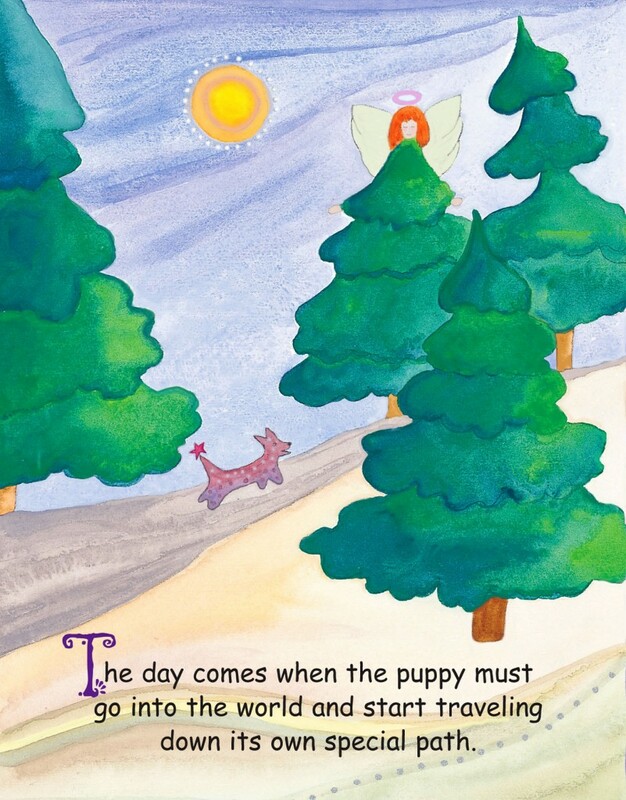 The day comes when the puppy must go into the world and start traveling down its own special path. A dog can never really be separated from its forever person. Neither time nor space can ever come between them. So when the dog comes to the end of its earthly life, and must go on ahead without its person beside them, the guardian angel becomes a loving bridge that connects the two friends for as long as the person remains on earth. What kind of dog is that? 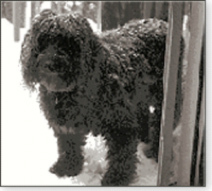 It was a question author Christine Davis heard many times over the years whenever she and her dog, Martha, were out together. 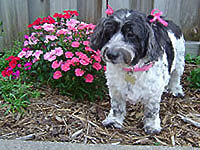 Part Poodle, part Bouvier and part shag carpet was the answer always given. 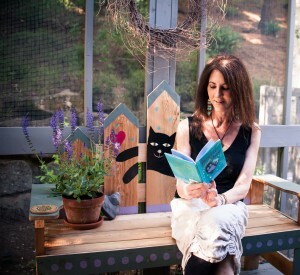 She had been born in the author’s home in 1982, and the two had been constant companions as they traveled together through life’s many adventures. In 1995, Chris felt the time had come to leave the corporate workplace and pursue her true heart’s calling. With Martha by her side, she knew she would discover her life’s purpose. But a few months later Martha became mysteriously ill and slipped into a coma. On a bright sunny day in October 1995, she held her friend for the last time as the doctor administered the injection that stopped the beating of the one heart the two had shared for thirteen years. Martha’s loss left Chris devastated and without direction. She visited a wise friend and talked about falling off her path. But Chris, her friend said, this IS your path – it just doesn’t look the way you thought it would look. Seeking words of inspiration, the author searched for a gentle book that might lift her spirits and bring her some comfort. 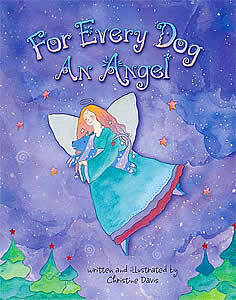 Unable to find a book that understood her feelings of loss and spoke to her heart, Ms. Davis wrote For Every Dog An Angel as a way of acknowledging the special relationship she and Martha had shared. 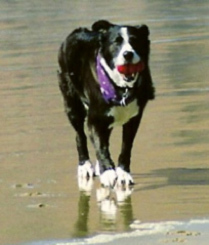 Shortly thereafter the author was adopted by Jake, a Border Collie and German Shepherd mix who needed a home and some people to love… and herd. Where will he sleep the animal shelter form asked. Anywhere he wants to was firmly written in. So Jake took his place on her bed and in her heart. Jake’s welcome basket included many squeaky toys and things to chew on, but over the first week they all disappeared. One day, the author was sitting by the rock garden that had become Martha’s final resting place, wishing Martha and Jake could have known each other. She noticed a rubber ball sticking out of the ground, and with a little digging exposed the rest of Jake’s toys that he had buried at Martha’s gravesite. Jake had offered his gifts to Martha in appreciation. At that moment the author knew that somewhere in a place called forever Jake and Martha had met and he had thanked her for making a space for him. And Martha had welcomed Jake home. After Chris said goodbye to Jake, a wonderful woman in Florida did something very special to help celebrate her dear boy. Fran Davis (not a relative, but a kindred spirit!) went to the Magic Kingdom and bought a big, blue balloon. She copied the author’s dedication to Jake from the inside of her Christmas book, and attached this…along with some pixie dust…with ribbons to the balloon. Standing in front of Cinderella’s castle, Fran said a prayer and let the balloon go up to the heavens. She said it was a beautiful day, and she knew that Jake, and her own beloved, Kelsey, were watching as the balloon made its way to them. From the author: “Thank you, Fran, for helping me celebrate Jake in such a magical way. I know your loving gift found him, for he has told me so. He also said next time send cookies! When Jake left that message for Fran, I didn’t realize how quickly it would travel from his heavenly heart to hers! In June 2007, on the one year anniversary of Jake’s passing, Fran sent another balloon up to Jake – this time with a cookie attached!